When my wife and I built Kenedy Texas Country RV Park & Resort Ranch, our purpose was to: "Build an RV Park where we would enjoy living ourselves!" Our vision was to provide: A generous amount of space, trees & grass, peace & quiet & a WiFi system & signal that would not slow down & could be picked up in each and every RV Space. For the comfort & security of the ladies who live here, we have a two person or one family unit limit per RV, which prevents a "Man Camp" environment. Each RV Space has trees, grass, shade & a picnic table. There is a new Speed Queen washer & dryer costing $1/load. We are located on a very nicely paved Farm to Market road. We have beautiful landscaping & we keep the grass mowed & trimmed. Our RV Park road & vehicle parking spaces are graded often & whenever needed. Kenedy Texas Country RV Park & Resort Ranch has the nicest, most well kept & spacious RV Spaces & RV Lots you will find in Karnes County! Our Wi Fi system & signal are state of the art, as are our electric grid, water & waste water systems. We are Rob & Debbie Wright and we are personally committed to your comfort & safety & peace & quiet while you reside in Kenedy Texas Country RV Park. We are only a phone call away at all times to respond to your questions or needs & we answer all calls promptly. We feel that our RV Park Rules reflect our commitment to your safety, comfort & peace of mind whether you are working or vacationing. 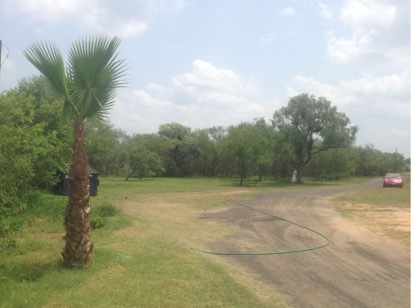 You can be guaranteed of a good nights or days sleep & a pleasant stay here in a beautiful South Texas country setting, surrounded by irrigated hay pastures. 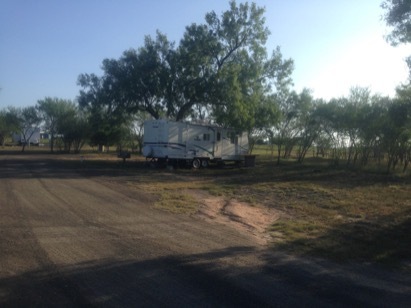 Our RV Park is securely fenced & pet friendly. There is no oil field noise or equipment parking for miles. There is no hi-way noise. We are conveniently located ten minutes from downtown Kenedy, Texas. Please call Rob or Debbie at (512) 496-1974.